MORE THAN READY (USA) (Bay 1997-Stud 2001). 7 wins-5 at 2, Saratoga King's Bishop S., Gr.1. Leading Aust. Sire of 2YOs twice. Sire of 2412 rnrs, 1770 wnrs, 192 SW, inc. More Joyous (ATC Queen Elizabeth S., Gr.1), Catholic Boy, Sebring, Prized Icon, Phelan Ready, Benicio, Roy H, Samaready, Verrazano, Entisaar, Rushing Fall, Room Service, Regally Ready, Perfect Reflection, Dreamaway, Uni, Eagle Way, More Than Sacred, Perfectly Ready, etc. THUMP (f. by Red Ransom). 4 wins at 1200m, 1400m, A$504,500, ATC Silver Shadow S., Gr.2, Surround S., Gr.2, Triscay S., Gr.3, MVRC Champagne S., Gr.3, 2d ATC Sweet Embrace S., Gr.3, 3d ATC Furious S., Gr.2, VRC 7news P., L, 4th ATC Royal Sovereign S., Gr.2, BRC Hinkler H., L.
Snoopy (g. by Lope de Vega). 7 wins-1 at 2-to 1400m, A$414,500, to 2018-19, VRC Western Health Pharmacy Cup, MVRC Hille's Home Extensions H., BRC Artisan Clinics H., ATC Theraces H., MRC Cove Hotel H., 2d Scone RC Luskin Star S., L, ATC December H., GCTC Bat Out of Hell H., BRC Inglis Easter Sale H., ATC Racing Mates H., 3d MRC Autumn S., Gr.2, BRC George Moore S., Gr.3, ATC Ranvet H., 4th MRC Caulfield Guineas Prelude, Gr.3, SCTC Lightning H., L.
Wolfsburg (f. by Husson). Winner at 2, BRC Channel 9's The Voice 2YO H., 3d BRC BCD Technologies 2YO H.
Lethal Bond - Comfort Life (H.K.). 4 wins to 1550m to 2017-18, SAJC Resourceco H., HKJC HKU Space H., 2d HKJC Tolo Harbour H., 3d HKJC Yeung Uk H., Sunset Peak H.
Mossman's Gold. 4 wins at 1000m, 1100m in Aust. Hard As (f. by All Too Hard). Winner at 2 in 2017-18 in Aust. MONGOLIAN WOLF (Pluck). 5 wins-1 at 2-from 1200m to 2400m, NZ$35,510, A$156,100, to 2017-18, ATC Frank Packer P., Gr.3, Counties RC NRM H., SAJC Medallion Homes H., 2d SAJC Fleurieu Milk H., AAMI H., 3d Avondale Guineas, Gr.2, SAJC Soul Growers Wines H., 4th Levin RC Ryder S., L.
Wowsers. Winner at 2 in 2018-19, SCTC Bridgestone Noosaville 2YO H.
Teoflyte. 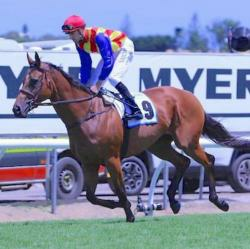 2 wins at 1600m, 2200m in Aust. OOMPH (Flying Spur). 6 wins. See above. NOBLE RED (Red Ransom). 3 wins from 1400m to 1800m, A$285,850, VRC Chester Manifold S., L, Super Impose H., Riverbank H., 2d MRC Victoria Gold Cup, L, 3d VRC Paris Lane S., L, Kilmore Cup, L, VRC Baguette H., 4th Victoria Derby, Gr.1. Trotsky - Bintang Biru (Mal.). 5 wins from 1150m to 1600m in Aust. and Malaysia, 3d AJC Milperra H., Selangor TC Korea Racing Authority Trophy. Dirty Martini. 2 wins at 1100m, 1200m, 3d BRC SITA Environmental H.
Shigeru Nanafusigi. 5 wins at 1400m in Japan. Zerocco. 2 wins at 1200m, 1600m in Aust. NOBELLOTTO (Bellotto). 7 wins. See above. Janderado. 3 wins at 1200m, 1850m, STC Telopea H. Producer. Shanikov. 6 wins from 2000m to 2400m, A$101,470, SAJC CFMEU H., Rhodes Waterside H., Mistral H., Boxing Day Family Day H., Pewsey Vale Vineyard H., 2d SAJC Allan Scott Park Morphettville H., Smoke-Free H., Australian 4WD & Adventure Show H., YC Twilight Party Book Now H., 3d SAJC Distinctive Homes H., Hop Skip & Dump H., Jayco H., 4th SAJC Hill-Smith S., L.